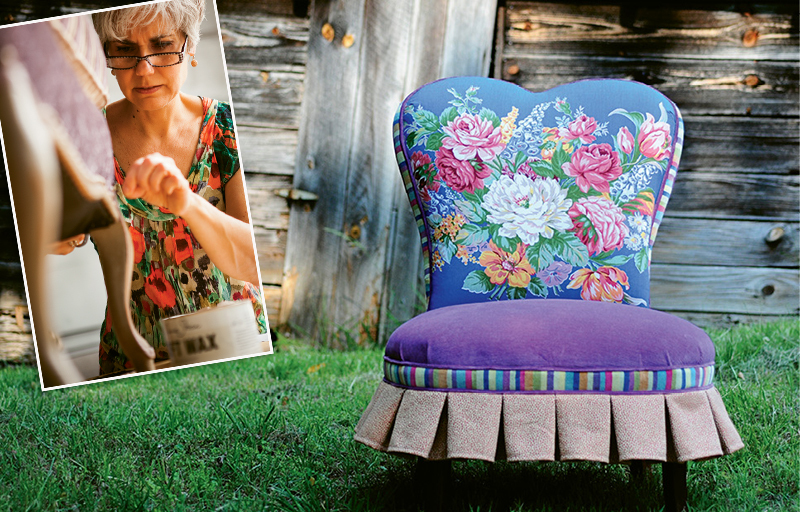 Jill Towery’s statement furnishings, like this jewel-tone channel-back chair, are produced with upcycled upholstery fabrics, and each is one-of-a-kind. An array of richly patterned and contrasting fabrics add texture and intrigue to tuffets, settees, and chairs. Pieces like this Flirty Skirt vanity chair are often produced in collaboration with clients to fit within their home stylings; (inset) Jill Towery at work. You don’t need a very long memory to recall the time in home furnishings history when overstuffed was the order of the day and the color palette for upholstered furniture ran the limited gamut from beige to oatmeal to buff. In those days, just before the financial crisis, the outlook for the furniture business in the Hickory/High Point area was bleak. Factories in this historic furniture region had closed, with many of the manufacturing jobs going to China. A lifelong upholstery enthusiast, Jill Towery of Bethlehem (in Alexander County, outside of Hickory) would visit the remaining factories to collect “short ends”: the remainders left after the majority of a fabric on a bolt is used up or sold off. These leftovers were there “in abundance,” she says. Sometimes she’d be invited to collect them straight off the factory floor. A banker turned stay-at-home mom, Towery used them in the custom reversible handbags she began making in 2007.
Business was going well when, knowing of her skills and her growing collection of fabrics, a friend asked if she’d reupholster a camelback sofa. Her first project, made in her basement, was a success. There were so many resources available in the area, so many skilled upholsters out of work, that Towery decided to tap into that expertise to create more pieces for a trunk show at a local boutique, where her items promptly sold out. Going even bigger, she hired two High Point sales reps to represent her work at the annual fall furniture mart in 2012, where her inventory sold out on the first day. The demand for quality, unique furniture made in the US was once again on the rise, and the furniture world was ready for Towery’s Salmagundi line, consisting of chairs, settees, and tuffets. The company’s unusual name comes from a seventeenth-century salad dish, a mix of fruits, vegetables, and meat. It’s come to be shorthand for any kind of interesting mix or mélange, like the ones that Towery creates in her designs. She calls her signature look “sophisticated bohemian” and “on the feminine side,” pairing patterns and solids in surprising and delightful combinations. “It used to be hard to find colorful fabric,” she says. “I’m glad to see it’s coming back.” Each chair or settee design typically consists of 12 to 14 pieces of fabric. Despite the many contrasts, the results are remarkably cohesive, and even more remarkable considering Towery has no formal design training. Towery’s typical clients are “not afraid to express their individuality,” she says. She will often go to a client’s home and say, “Show me what you like,” to a get a feel for the person’s style. From there, she creates a palette. Towery originally thought that clients would buy just one piece of her furniture as an accent for a room. But now she’s had projects outfitting whole rooms and houses with her one-of-a-kind pieces. The increased demand doesn’t mean that she’ll change the core of her business. Each piece is still unique, and because of that, Towery doesn’t plan to significantly expand. “I’m going to remain true to what I am,” she says. In addition to selling custom pieces directly to individuals, her designs can now be found around the Southeast in boutiques such as Asheville’s Désirant and AmericasMart in Atlanta, and at galleries as far away as the West Coast and Canada. “When you do what you truly love,” she says, “it just works. Learn more at www.salmagundidesigns.com and shop the line locally at Désirant in Asheville.